Umm, so it's Friday the 13th. Did you know that? I'm not the least bit superstitious, but that doesn't mean I won't blame anything bad on today's date. Just saying. Anyway, on that note, I hope you have a wonderful weekend and Friday the 13th. It's Friday after all, right? 10 non-tacky ways to wear red and green. Some more cute ways to address those envelopes. Speaking of snail mail, do you have a pen pal? With blogging, it honestly seems like it's made a comeback and I love that other people share my love for good old snail mail. The most perfect winter party ever. A DIY gift round-up I wouldn't mind making/giving or receiving. This looks soooo good right now. I am loooooving all of your Christmas decorations, ladies and fellow bloggers! If you want some inspiration or if you want to join in the fun, link up here! How to make your own snow day. Even though we've had snow, this idea/blog post is brilliant and I'll definitely have to do this once the snow melts and I'm longing for snow again. The cutest pin ever. Hands down. One of the little kiddos must have passed on a lovely stomach bug to me last weekend because it hit. On the only weekend it snowed. Let's just say I feel a little bit jipped(sp?) on the snow day thing. But on the brightside, I do have give a huge shoutout to my family for taking care of my this weekend. Ya'll are the best. For bloggers and blog readers everywhere. Have you played along and answered these questions yet? You know how much I love getting to know you, so here's your chance! A beautiful photo project worth reading about. And a truly beautiful video of a truly beautiful young woman. I know I say this all the time, but if you haven't heard of Amazing Abby, you've got to check it out. The perfect goal for this month and holiday season. A brilliant way to use your instagram photos this Christmas. I was cleaning the classroom this year (in preparation for when the kiddos come back) and played a little Christmas music to liven up the room. Um, apparently this girl over here forgot the magic of Christmas music because it was, well, just magical. On saying yes to open adoption. Such a beautiful post. Her new blog look is simply adorable. So glad Ashley's making this printable again. So glad. Be present over perfect. This is a life motto, not just something to remind ourselves of during the holiday season (although, it's an important Christmas message, too, if I do say so myself!). Happy Weekend! I'm hoping to get some more Christmas shopping done sometime this weekend, what about you? Are you all done, wrapped, and everything? Or not so ready like me? p.s. Looking for some more good links? Check out this lady's post. There are so many great links, they're too good not to share. I'm a tad bit jealous of those berry bushes... I've stalked some in our neighborhood because I NEED some to decorate with!!! Haha! That's awesome! I believe I would have to find out whose they were and bribe them to let me grab some! I know, right? I saw them and loved them up against the white, white snow. And now that I think about it, they really are pretty and would look great as Christmas decor, too! I seriously love that you do this. those outfits are too cute! I loved the skirt with the bow, so cute! No i don't have a pen pal, but i love snail mail! I love sending little cards to my friends, we should totally do that!! winter party--loved it! I would so go to that, if you did that! that recipe--looks so good! You are right girl! love your linkup, and you of course! 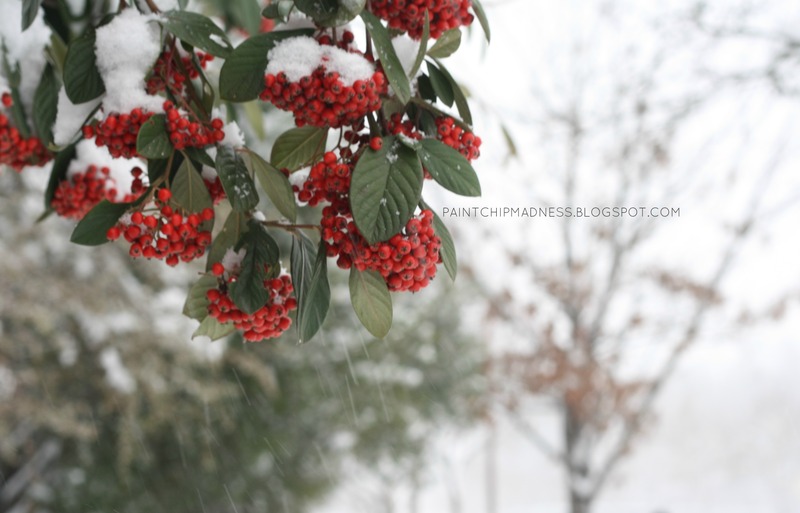 the snow day--love Samantha's blog, she has such fun ideas. pin--so cute! love the little trees. aww. I hope you are feeling better girl! that's no fun to be sick. questions post--loved that post. definitely hope you do it again! photo project--that was awesome. loved all the little photos. i love Shawna Niequist--loved her book Bread and Wine. so good! Instagram photo tags--sweet idea! The little dog one was so cute! blog design-- cute! love it! printable-- love it! I want to print this out, such a good idea! yes i still have Christmas shopping to do, It's crazy! love Amy's blog, she is such a good writer! I'm all for non tacky ways of wearing red and green... I'm also all for 100% tacky outfits in red and green. I am that cheesy Christmas lover... no shame here! :) I love getting mail so penpals are awesome!! Danish braid uh yum! And that little Christmas terrarium is THE cutest!! I am super behind on my blog reading, but once I get to your questions post I will most definitely answer them! I honestly don't have any red and green in my closet (weird, right?) but I love seeing new ways to wear outfits and now I just might need to get some red and green, haha. :) And hey, Christmas cheer is always good, no matter how your show it.